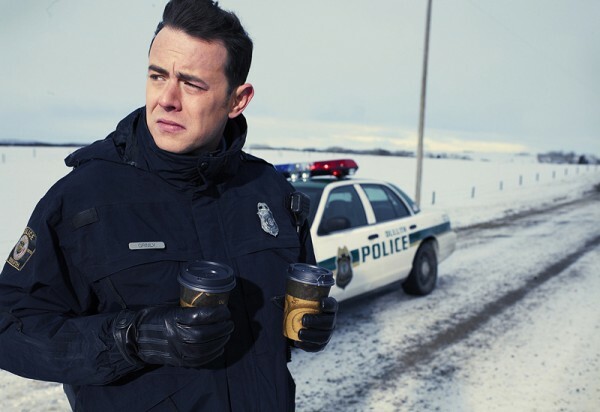 Colin Hanks has carved out his own distinguished acting career in the shadow of his father, Tom, and his latest role is in the critically-acclaimed FX series “Fargo.” As Gus Grimly, Hanks plays a meek police officer who, in a pivotal scene of the premier, lets bad guy Lorne Malvo (Billy Bob Thornton) get away after he pulls him over for routine traffic stop. And we aren’t talking a mere oversight here; Malvo tells him point blank he’s a bad guy and it’s in his best interest to just let him go for his and his daughter’s sake, and Gus does. We joined Hanks on a media call to discuss the complexities of his flawed but well-meaning character, and in particular, getting that scene right. Q: Do you think that in that first scene with your character and Billy Bob Thornton, that it speaks to the question of what is a hero because Gus has different things to worry about in his life, like the safety of his daughter? And also, we have to believe that your guy is nice enough and cares about his daughter enough that he has that stuff going on in his mind, plus Billy Bob has to be threatening enough that we have to buy it that just looking at you would intimidate you enough to let him go. Colin Hanks: Well, I think it’s an interesting point. Obviously, with Gus, you definitely don’t think “Oh, well, here’s a hero.” He doesn’t necessarily hold himself in a heroic stance. He doesn’t necessarily speak in heroic tones or anything like that, but again, in approaching this in as realistic a manner as we can — and that was a goal for all of us with the show — oftentimes, your real heroes are not necessarily six-pack abs and huge biceps that come and save the day. They’re people that maybe don’t want to be heroes. The thing that they’re doing, they don’t want to be doing, but they have to do it because they’re compelled to do it. Oftentimes, I find that the people that you really call heroes, they’re just doing their job. They’re doing what they’re supposed to do because they have a sense of duty, but it’s not this super “Cue the music telling the audience how to feel, here’s our hero moment.” They call them hero moments, for Christ’s sake. But for Gus, I feel like he doesn’t want to be doing what he’s doing. He would much rather have not pulled … Lorne Malvo over, but he’s doing what he’s doing out of a sense of responsibility because it’s the right thing to do because he’s trying to set an example for his daughter and I think it’s fair for you to say that that’s heroic. I don’t know if it’s fair [for] me to say it, but I think Gus is a good guy trying to do the right thing, and sometimes — and clearly, in that scene — sometimes doing the right thing is technically the wrong thing to do, and so, he tries to right that. If that’s heroic, then yes. Q: Do you think Gus can cut himself a bit of slack a little bit too in the sense that in this situation, he actually has a split second to make a decision? And then it’s easy for him to regret it after or for everybody to criticize him, but your character had a split second to make this decision, and you have Billy Bob staring at you with his evil eyes and you’re thinking about your daughter. CH: Well, and you can even argue that Gus didn’t even make a decision. You can argue that Gus just was so scared and had so many things running through his brain at that time that that caused a paralysis in him in which he didn’t even let him go — he tries to make a move but he ends up not making a decision and Malvo just leaves. Q: Yes, he just rolls up the window and it’s over. CH: So, for me, again, I really — that scene, you’re lucky if you get a scene like that as an actor. You’re lucky if you get one scene like that, and I remember some people are like “God, that must be a bummer, you’re only in one scene in the pilot.” And I’m like look, if you’re only going to be in one scene in the pilot, that’s the scene you want to be in because there’s so much going on within that moment, within that moment between those characters, within that moment just within Gus, and I think that that scene, everything is at work there. You see Malvo and the way that he plays people and the way he manipulates people with fear, with intimidation. You see Gus completely out of his element, not sure what to do, and his indecision is in a way his decision, but that eats at him and it will eat with him for the rest of his life. That is a decision that he will have to live with forever, and so, man, that kind of complexity within a scene, within characters, as an actor, you salivate for that stuff. “Fargo” is one of the hottest shows of the season, garnering rave reviews and continuing the dark humor of the film, but with a whole new cast of characters, including Martin Freeman, Allison Tollman, Oliver Platt, Bob OdenkirK and Keith Carradine, in addition to Billy Bob Thornton and Colin Hanks. It airs Tuesday nights on FX.